Welcome to BMES and GABE! The Biomedical Engineering Society (BMES) is the student group for undergraduate bioengineers. The Graduate Association of Bioengineers (GABE) represents Master’s and PhD students. Penn is the newest recipient of a $24 million NSF Science and Technology Center award, with the goal of developing a new field merging the physical sciences, engineering, and cell biology. We are actively recruiting graduate students for 2017 (both first years who want to join center labs, and students currently applying who would join the center after year 1). Many people in BE (Rebecca Wells, Rick Assoian, Rob Mauck, and Paul Janmey) are in the center, such as Jason Burdick, Dan Huh, Vivek Shenoy, Dennis Discher, Susan Margulies, and Beth Winklestein. 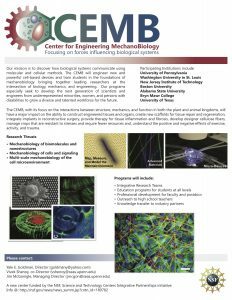 If you are interested in joining, please go to this website: cemb.org. 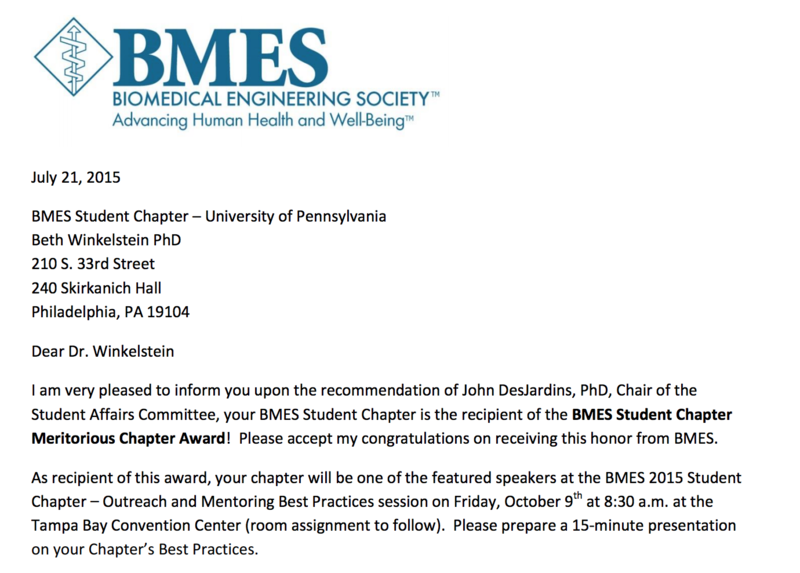 This last summer (2015) the BMES Executive Board and our faculty advisor, Dr. Beth Winkelstein travelled to the BMES 2015 Annual Meeting in Tampa, FL to accept the prestigious BMES Student Chapter Meritorious Chapter Award! 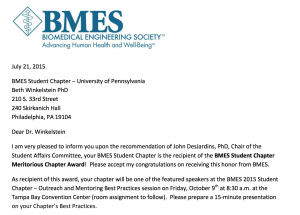 Penn BMES was selected after submitting a Chapter Development Report containing details on activities and events hosted by our chapter throughout the year. We couldn’t have done it without the support of our Penn Bioengineering Community! Want to get started with research at Penn? No idea where to start? BMES is here to help! With many years of experience and the advice of faculty and researches, we put together a guide to help you get your research career started. 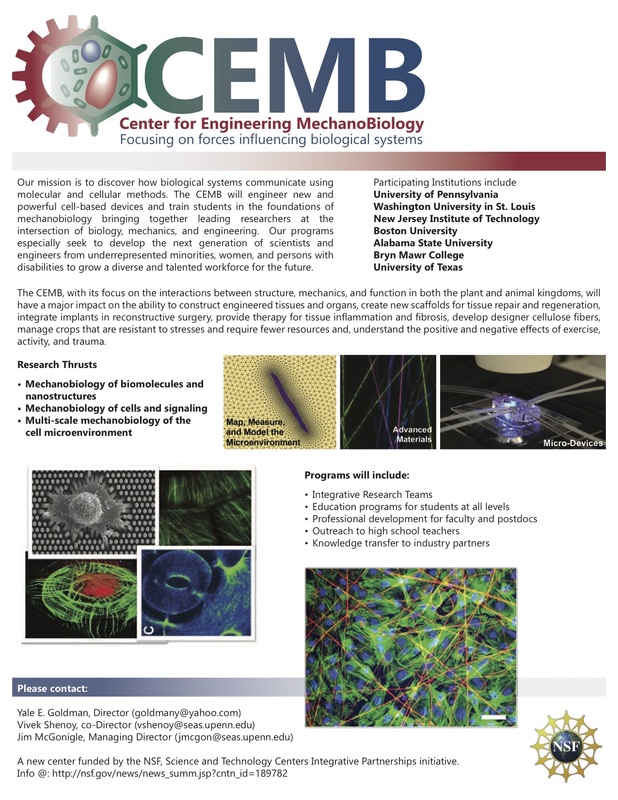 BMES is proud to offer a new opportunity for Bioengineering students in 2015. The BMES mentoring program will allow BE students to be matched with older BE mentors based on a variety of factors. Anyone can join, underclassmen can get upperclassmen mentors and upperclassmen can get graduate student mentors! For more information about joining the program (as a mentor or mentee), please email us at pennbmes@gmail.com.